George Adamski's Saucers are Still Flying High! George Adamski's saucers are still flying high - for some people, at least. 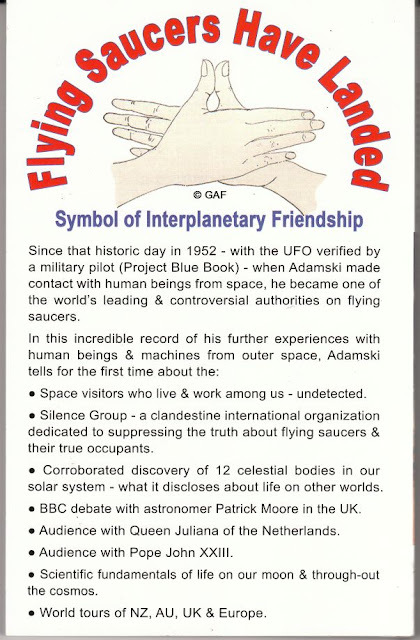 Glenn Steckling is the head of the Adamski Foundation, dedicated to promoting the teachings of the most famous of the "classic" UFO Contactees of the 1950s. After Adamski died in 1965, Glenn's late father Fred Steckling took over the Adamski Foundation from Adamski's longtime disciple Alice K. Wells, and continued the work of spreading the gospel of the Space Brothers. The Keys to that Kingdom have now passed into the capable hands of his son, currently "the only authorized & original source for George Adamski information." Steckling obviously can't afford a proofreader for his "Extrodinary" book. (Or even use SpellCheck). This most recent time, Steckling was passing out copies of his newest book to attendees. 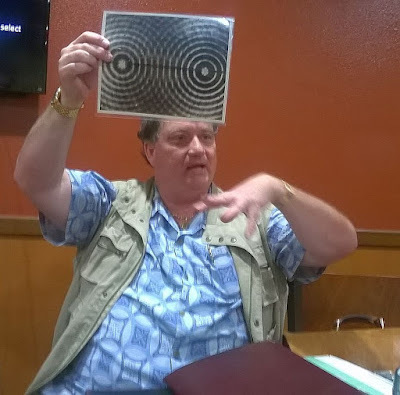 He said something to the effect that he had made up a lot of these books for the recent Contact in the Desert UFO conference, where he assisted in giving tours of nearby Giant Rock, and contactee George Van Tassel's Integratron, as well as selling Adamski stuff. Apparently the books didn't sell very well, leaving him with quite an inventory. Everything Adamski said is true. All his photos are authentic. "Bioluminosity" on the photos (whatever that is) proves that they are authentic. The Space Brothers are human beings physically identical to us. However, they are in a more Enlightened state of development, having overcome war, greed, exploitation, etc. Venus isn't nearly as hot as NASA tells us it is. NASA and the government know all about the Space Brothers, but keep covering up saucer information. There are approximately 200,000 aliens living on earth. He has met some of them. Steckling is nothing if not diligent. 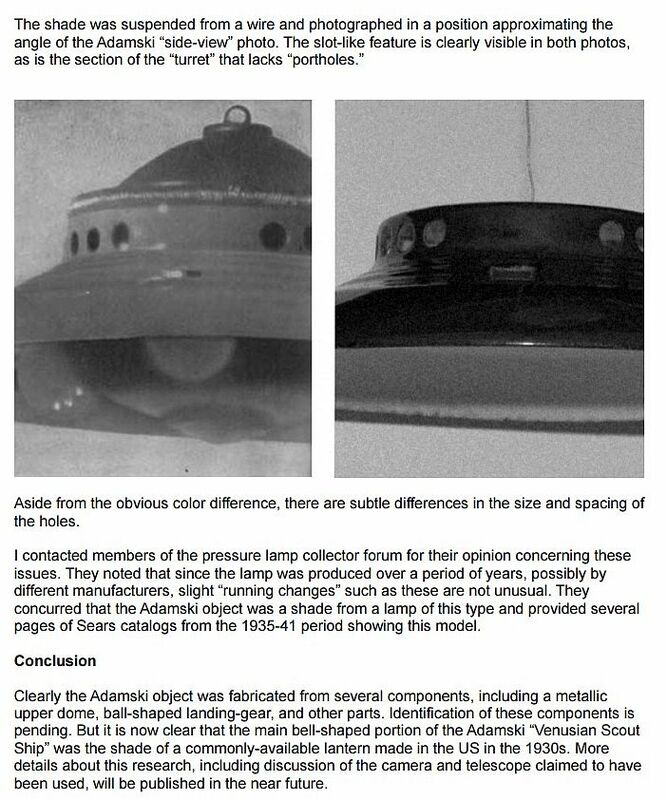 His list of things that Adamski's photos supposedly are not, chicken brooders and such, includes the most recent explanation, Joel Carpenter's argument that it is the top of a Coleman lantern. (I agree with Steckling that the resemblance of Adamski's "Scout Ship" photo to a "chicken brooder" is purely superficial). I placed Carpenter's explanation on the internet. I had been discussing various UFO cases with Joel Carpenter for several years, mostly the Trent/McMinnville photos. Unexpectedly, he sent me a copy of his paper "Preliminary Notes on the Adamski Scout Ship Photos," dated April 2, 2012, asking for my comments. I told him I thought it was probably correct, and didn't hear any more about it. Two years later, I learned that Carpenter had died, with his paper on Adamski unpublished. I began to reassemble the fragments of Carpenter's long-unavailable (and invaluable) website on the Trent photos, and placed all of it on the Internet Archive, in its original format. I also included Carpenter's "preliminary" paper on Adamski's Scout Ship photo, since there would be no later version. Carpenter's partial reproduction of Adamski's famous Scout Ship photo, using the top of a Coleman lantern. Today, does anybody besides Steckling still take Adamski seriously? Apparently, yes. Something like half of the people at the MUFON meeting seemed inclined to take at least some of Steckling's claims seriously. (The other half were rolling their eyes, along with me.) 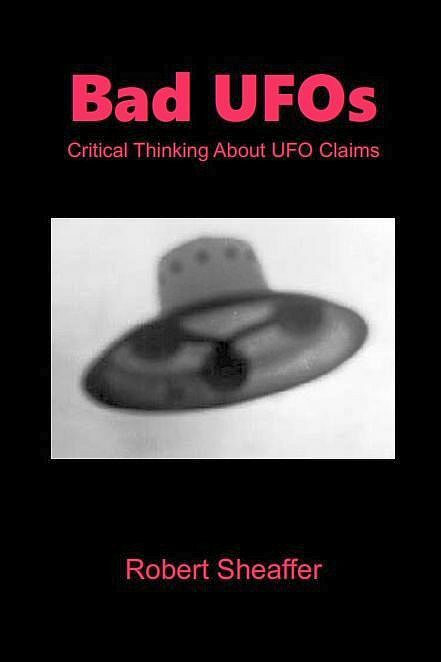 And among "serious UFOlogists," those taking at least some of Adamski's claims seriously include Timothy Good, James McCampbell, and Michael Salla. If you want a second opinion on the Adamski question, I strongly recommend the book A Critical Appraisal of George Adamski, by the Belgian UFO investigator Marc Hallet, assisted by the American researcher Richard W. Heiden (published 2015, revised July 2016). It is a free download on the Internet Archive (reviewed here by the Pelicanist, John Rimmer). Hallet was a former member of the Adamski cult, who while researching Adamski's life discovered a number of his lies and impostures. He presents a lengthy and detailed account of Adamski's life and lies, from an insider's perspective (which he summarizes here in a 2005 article, "Why I can say that Adamski was a Liar"). 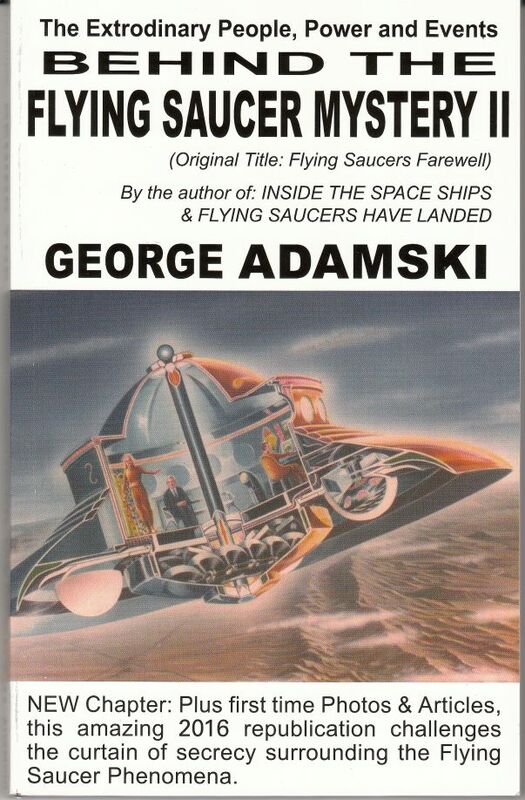 In fact, [Adamski's] Inside The Space Ships is nothing more than a science fiction book. The best proof we have of this is that it is a “remake” of a science-fiction book entitled Pioneers of Space which Adamski wrote in 1949. That book was ghost written by Lucy McGinnis and is now very rare. You can order a microfilm copy from the US Library of Congress and easily compare its content with Inside The Space Ships. Hallet was also in correspondence with Joel Carpenter, and includes Carpenter's "Coleman lantern" analysis. In the book, Hallet goes into Adamski's early days peddling dubious "mysteries"of the Royal Order of Tibet, many years before he met the Space Brothers. 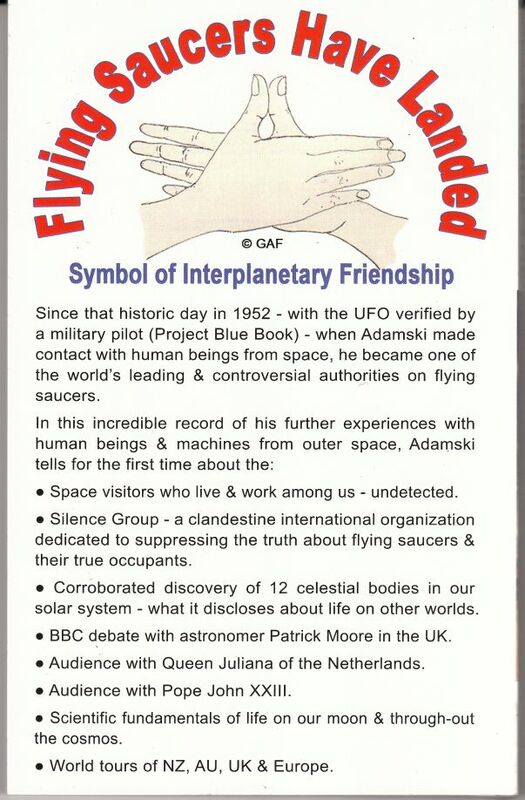 Today we would say that Adamski already had a long career peddling New Age rubbish when he discovered Flying Saucers.